drug, n: A substance that, when injected into a rat, produces a scientific paper. Also: a substance that, when taken by a hippie, produces a 23-minute drum solo. While I designed this index page to look good without frames, the rest of the site (and the navigation in general) works much better with them. Please, if frames are an option, use them. If not... the page still works; it's just more difficult to get around. Additionally, a 301 Moved Permanently error was encountered while trying to use an ErrorDocument to handle the request. 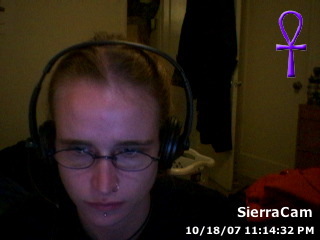 All text, images, and layout contained herein are Copyright © 1996 - 2011 Sierra Kempster unless otherwise indicated. All rights reserved.